Cattle for export to Middle East from Somaliland (photo credit: ILRI/Peter Ballantyne). Livestock are the backbone of the Somaliland economy. Livestock production accounts for about 60% of the country’s gross domestic product, 70% of employment opportunities and 85% of export earnings, and about 15% of total government revenue. 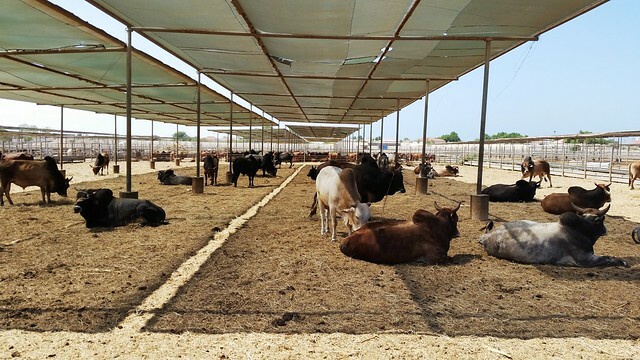 Despite being Somaliland’s biggest livestock export market, little is known about marketing channels, grading and pricing of Somaliland livestock in Saudi Arabia. A recent research report, ‘Saudi Arabia end-market requirements and the implications for Somaliland livestock exports’, sheds a light on these key issues and how they affect Somaliland exporters. The report found two main trading channels: the sacrificial value chain and the commercial value chain. The sacrificial value chain is active during the lunar months associated with Hajj and Umra pilgrim movements and other religious occasions when livestock demand is high, while the commercial value chain is dominant during the lunar months of Muharram to Jamadul Akhir, in which livestock demand is much lower. Grading and pricing systems differ between the two chains. In the commercial value chain, grading and pricing somewhat mirrors what happens in the Somaliland source market. The key difference is that livestock are clustered in three grades in the Somaliland market, these are collapsed into two upon arrival in Saudi Arabia. The report found that livestock landing as grade I were sold almost immediately. The other grades were held at fattening yards for varying periods and collectively sold as grade II. In this commercial chain, superior grades received premium prices. Conversely, in the sacrificial value chain, while animals are procured on the basis of the three grades in Somaliland, they are graded on the basis of religious practices specifying the type of animals that can be slaughtered for Hajj, and all are priced uniformly. The sacrificial value chain operates in accordance with rules of tender established by the Islamic Development Bank—specifying the number of livestock to be delivered (sheep and goats) and the selling price of each animal—so as to make sacrificial animals affordable to most pilgrims. However, the overall volumes demand for slaughter stock often exceeds volumes delivered through the sacrificial value chain. The extra demand is filled by getting animals delivered through the commercial value chain where forces of demand determine the price. During this period, sheep are preferred over goats and by extension are sold at a premium price in the commercial value chain. The sacrificial value chain seemed to favour Somaliland exporters, first due to non-discrimination against goats, the dominant species in Somaliland, and secondly, by waiving the grading requirement. This provided room for more goats of lower quality (grade III) to be exported. Since these benefits of procuring goats at relatively low prices and selling them at better prices were not transferred to producers, one may thus intuitively conclude that the sacrificial value chain offers an opportunity to participating traders to build their capital base and dominate the export market. Furthermore, it was observed that margins realized by Somaliland exporter–Saudi importer partnerships were relatively low for small ruminants (18–30%) and poor (below 10%) for camels. Low margins in live animal trade imply that the trade is fraught with risks, such that mortality in transit leads to a severe erosion of the profit earned by those actors involved. Overall, Somaliland sheep and goats were noted to be smaller and of lower weight than those from competing countries and thus served a market niche for lower/middle income consumers. Somaliland, particularly, has comparative advantage in the supply of goats where it commands up to 85% of the market share. This is a strength that should be exploited, especially in off-peak season, which apparently offer better prices for goats and of which producers should be made aware. The report was produced by the International Livestock Research Institute (ILRI), Terra Nuova (TN) and the IGAD Sheikh Technical Veterinary School (ISTVS). Various Somaliland livestock exporters and their Saudi partners provided information that facilitated the assessment. Funding was provided by the Danish International Development Agency (DANIDA) and the CGIAR Research Program on Policies, Institutions and Markets (PIM). Tags: DANIDA, ISTVS, Terra Nuova. Bookmark the permalink.